I know I have posted this photo on the blog before, some time ago. But it sees to convey what I am feeling, so out it comes again. We need spring here in Western Pennsylvania. I know people have worse winters than ours.......but it really has been a brutal and never ending frigid winter here. It has to end soon.....I just wish the Earth would get through this tilting thing and get us oriented in the right direction. This is what we need. Some warm green growth with flowers that you can walk among without being bundled up. And a nice tree to sit under as well! This particular photo was taken at Jennings Environmental Area. Every year in July/August I visit Jennings Environmental Center. Jennings is an environmental anomoly. It is a midwestern prairie that was formed in Western Pennsylvania by glacial movement during the ice age. And with that comes prairie vegetation....most notably Liatris spicata......the "Blazing Star". This year, I felt like I was being a little repetitious, making compositions that just involved the Blazing Stars. So I 'forced myself' to make photographs of the other things around me on the prairie. 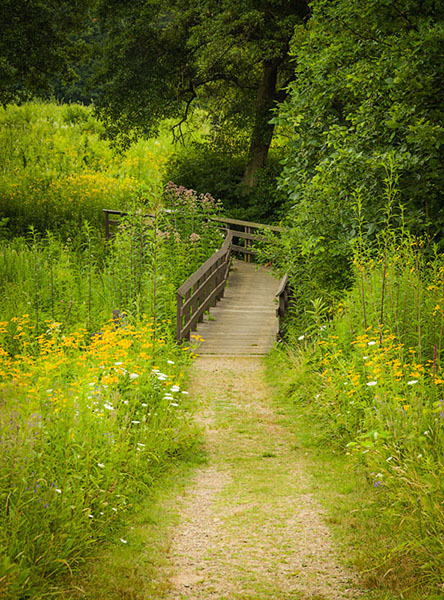 I particularly enjoyed this photograph of the trail and a small wooden bridge surrounded by wildflowers. I made this visit with several friends. Though it is barely visible in the small web image below, two of them managed to get into the photo and I hadn't noticed them when I took it (they are just under the branch of the tree). But they are quite visible when the photo is printed, even to 8x10. So, Tim and Bob, if you happen to read this.....prepare to be cloned!